Welcome back to more 31 Days of Love! 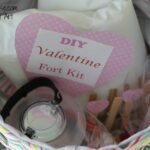 Today we start on Valentine’s Gifts That Kids Can Make! This section is kicked of by Meredith from Homegrown Friends with this wonderful and very special looking White Clay Recipe – a nice alternative to Salt Dough, and the Loving Memory jars to go with them! 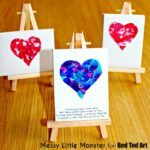 I am so excited to be one of the bloggers participating in the 31 Days of Love Series on Red Ted Art! My name is Meredith Magee Donnelly. 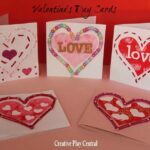 I am an Early Childhood Educator, mother of three and creator of the blog Homegrown Friends , a site dedicated to children’s activities, recipes and literature recommendations. While brainstorming a gift my children could give to others I wanted to create an opportunity to easily share their loving feelings. 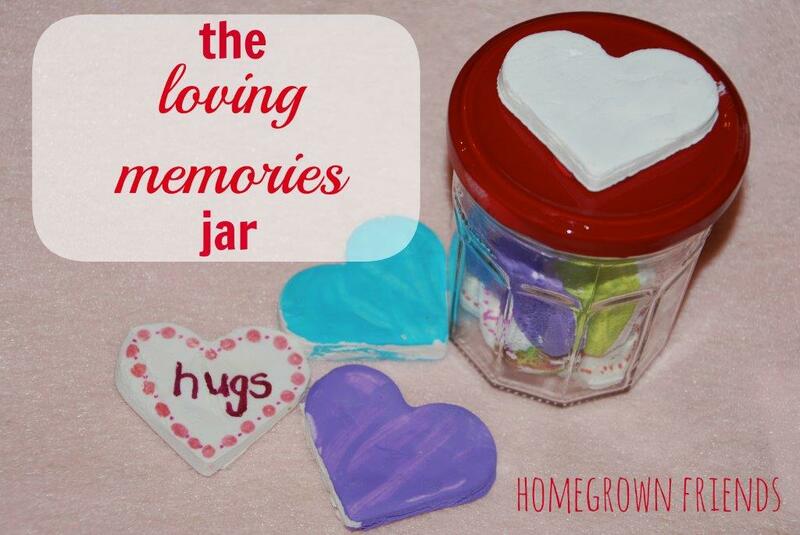 The Loving Memories Jar is filled with happy memories written on painted clay hearts. We gave ours as gifts to my children’s Grandparents and their Daddy. It was such a sweet moment to watch them open the jars and enjoy the happy memories! 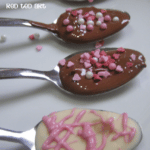 Begin by making the DIY Whit Clay recipe. 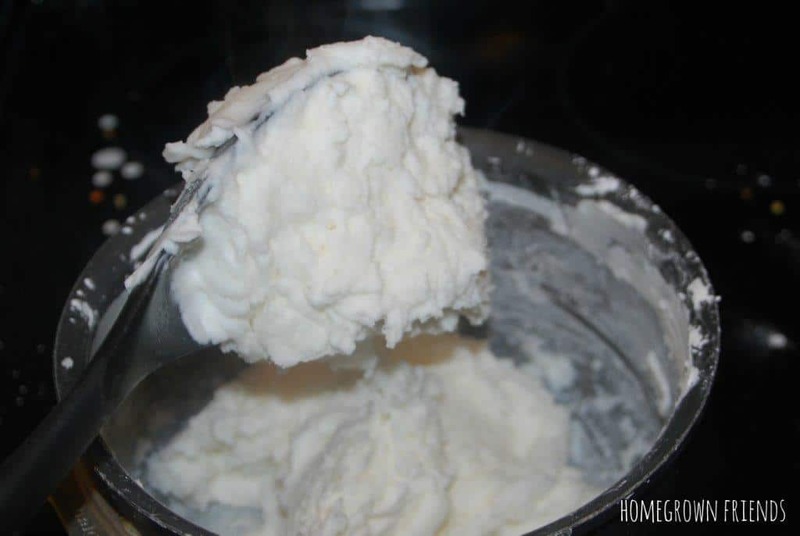 In a large pot mix together 1 cup baking soda, 1/2 cup cornstarch (corn flower) and 3/4 cup warm water. Stir over medium heat until the baking soda mixture resembles playdough. This will take a few minutes. Dump the baking soda clay on a counter or table and let cool. Roll the baking soda clay out on a floured surface making it approximately 1/4 inch thick. 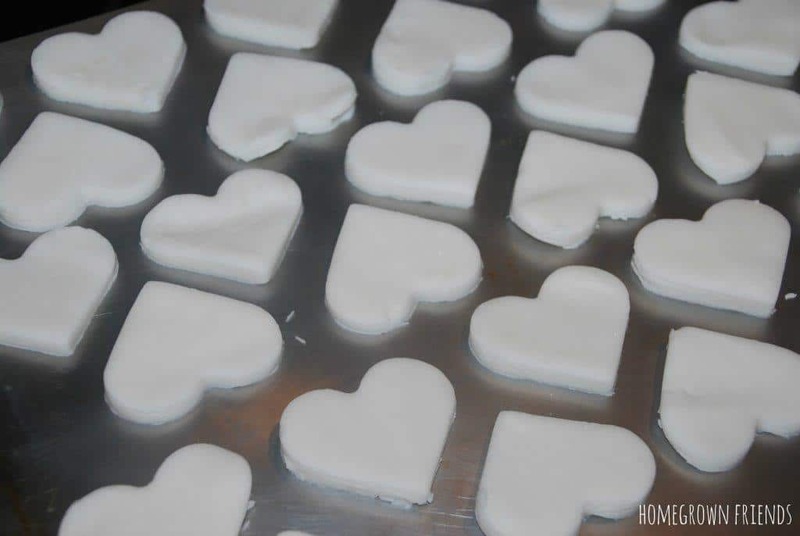 Cut out hearts using the heart cookie cutter. Using a spatula carefully transfer the hearts to a ungreased cookie tray. Bake at 200 degrees F (100 degrees C) for approximately 1 hour. I flipped mine over after 45 minutes to make sure the underside cooked. Once cool set up a painting station for your children. 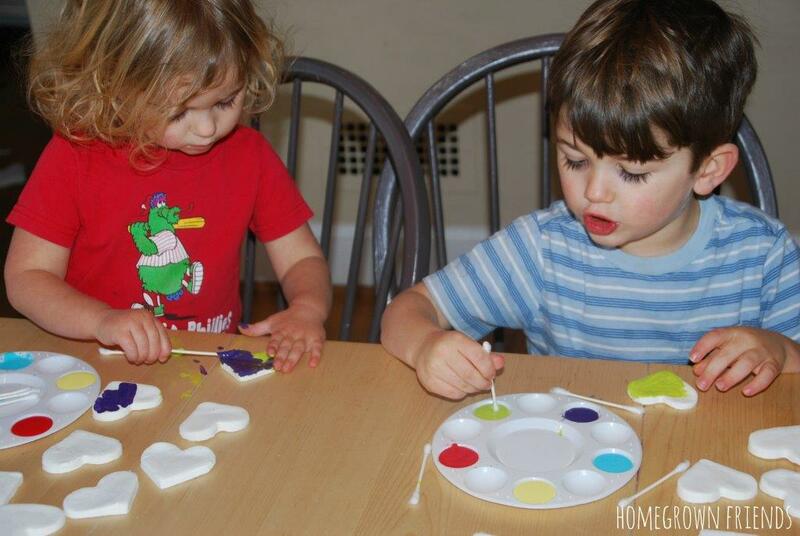 Each child received a painting palette with acrylic paints, q-tips to paint and the clay hearts. I encouraged my children to think about each person we were making the gifts for while we painted. It was fun to watch my children choose colors that they thought their Grandparents and Daddy would love. This naturally led to talking about each person and sharing memories. It was a happy painting session! Once the paint is dry it is time to write why you love the gift recipient on the back of each heart. While sitting on the couch with my children we made a list of why we loved their Daddy, Grandma and Grampa. I wrote the names of each person on a piece of paper and we made a chart of all their loving answers. It was truly beautiful to listen to their thoughtful answers. What immediately struck me was the simplicity of their memories. They love that their Grandma sews with them and gives them crackers. They love that their Grampa sleds with them and paints wood pieces. Playing tag, giving hugs and getting to go in our attic are their loving memories of their Daddy. Using a permanent magic marker I wrote each loving memory on the back of each heart and then placed all the hearts in glass jars. I spray painted the top of each jar red and glued one of the clay hearts to the top. This is optional, but I love how special it makes each jar look! We wrapped the gifts in some of Homemade Wrapping Paper. It was so much fun to watch my husband and parents open their gifts. At first they were slightly confused and then as they opened the jar and began to read each of my children’s happy thoughts they were delighted. I hope you enjoy making The Loving Memories Jars for all the loved ones in your life as much as we did! Looking for more simple gift ideas? Here are some of our other favorites! 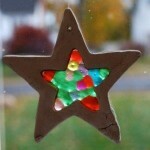 Salt Dough Suncatchers , Valentine’s Day Playdough and DIY Flower Bouquet and Vase . Meredith Magee Donnelly, MS, Ed is an Early Childhood Educator and mother of three children. Meredith received her Masters in Education from Bank Street College of Education. Prior to becoming a mother Meredith taught Preschool and Kindergarten and now is a stay at home mother to her 5 year old boy and twin 2 year old girls. 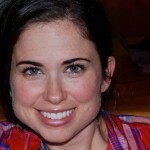 Meredith created the blog, Homegrown Friends, to share her knowledge of childhood development and play-based education. The white clay looks AMAZING! And what a sweet idea to make memory jars. Great activity! It was such a pleasure to be a contributor for this series! 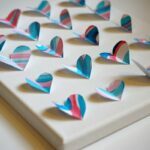 Looking forward to reading all of the posts in 31 Days of Love! Have fun. If it dries too quickly, you can try salt dough with her instead! 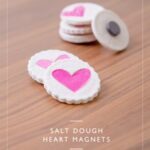 What a sweet idea, we just made salt dough hearts yesterday but I we will have to try these out as well with corn starch. Great idea! We’ve got some baking in the oven as I type this. A few things I would like to point out….it dries really quick, so don’t wait too long before rolling it. Also I used wax paper instead of flour to roll them out on, worked great. Oh, and one more thing, if you have bits left over (like I did) out it back on the stove add a little bit more water & you can keep using it. Our dried out too quick to be able to re-roll it without reheating it. I love the whiteness of this clay. What a wonderful idea, thanks for sharing. We’re sending ours out as Christmas thank you’s! Oooh thank you so much for the tips! Had heard it dries quickly, so good to have it confirmed and how funny that you can soften it again ON the stove! Oooh wonderful. So pleased for you! Love this idea. What a special thing to do for loved ones. What a lovely idea! I hope you are feeling better. I love this idea. 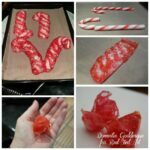 I can’t wait to try these with my little girl – I know what we’re doing on Saturday! Thanks for the inspiration. How many ornaments will one recipe make? 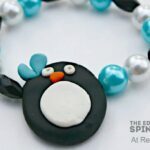 I am unsure, sorry – as this is a guest post! And it also depends on how thick you role it out. I guess a tray full though? Thank you for the white clay recipe! I have been wanting one for something almost like this! Also, I am hesitant to mention this as it has nothing to do with the actual post, but since the author is an educator…I thought she might want to know. Corn flour is misspelled in the post. I would want someone to let me know if something like this slipped past my spell check in a post. Thank you again for the recipe. I just finished baking mine about 2 hours ago. They aren’t hard? They are still soft enough to squish?? Do I need to cook them longer?